You finally are graduating from high school and feel excited about enrolling in a university. Then you think about moving out and becoming independent as you are bound to expand your horizons but at the same time, you feel anxious too. University life is never easy. You will soon find yourself strolling along the halls of a strange new place, meet unfamiliar faces, mingle with everyone else, compete with equally intelligent students, and start building for your future. It will be a totally different environment. Getting ready to face the university life will make everything manageable despite the rocky road you might be traversing. I say rocky because definitely, it won’t be that smooth but the tips included in this book and the scenarios given will surely make things easier to handle. 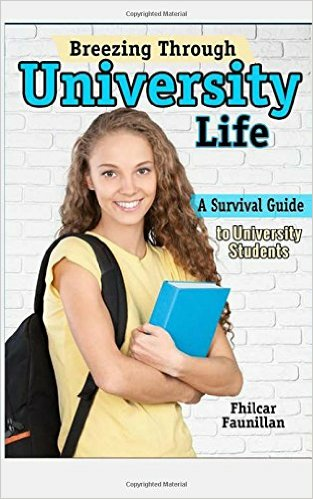 This book will be your survival guide throughout university life. You will be guided from the very moment you step into the campus until you earn your degree. Dorm life, dealing with professors, joining clubs, study places, money tips, dealing with classmates, professor and everyone around, acing exams, and a lot more will be tackled in this book. So be ready so you will have the grandest entrance and the most gracious exit – that is, with flying colors.